For this Christmas card for a dear friend, I really wanted to focus on the reason for the season, which I felt called for simplicity I used some of the brown papers of the Basics collection paired with the Prince of Peace stamp set. After stamping the star sentiment in Nutmeg, I used my gold marker to trace over the star. 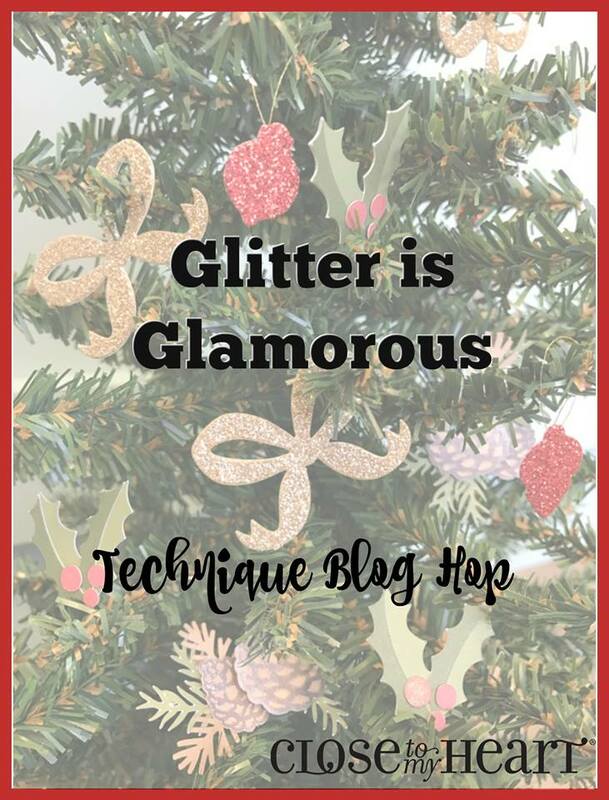 I used some burlap ribbon and gold glitter gems to highlight this sentiment. The inside nativity scene was cut with the (retired) CTMH/Cricut Artfully Sent cartridge. All I had to do was choose my papers and cut them at 7" according the Cricut guide, then assemble. While you can't see it in this picture, I wrote my Christmas wishes in gold marker on the inside of the card (in front of the nativity scene). Now that I have made this one, I am thinking about making another pop-up card that I can set on a table in my house. 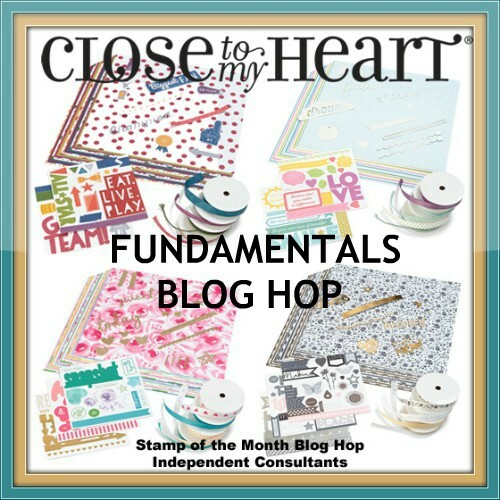 Thank you for hopping through the Basics Fundamentals Featured Paper blog hop! I wish you the very best this holiday season! 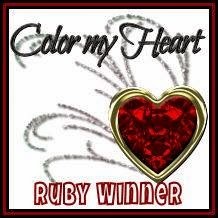 I would really appreciate a comment before you head off to visit RaNae's blog next. Merry Christmas! My card begins with a White Daisy card base that I've added Basic Fundamentals to, plus Bashful glitter paper and Silver shimmer trim. I used the Flower Market CTMH/Cricut cartridge to cut the heart-shaped sentiment and Bashful glitter mat. I stamped the sentiment in Charcoal and the heart in Bashful from the set A1192, Happy Hearts. I wish you could see the shimmer in real life! 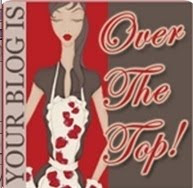 Please leave a comment before visiting Darlys's blog next! Thank you! This treat holder measures 2.5"x3.25" and holds a sweet square of chocolate inside. 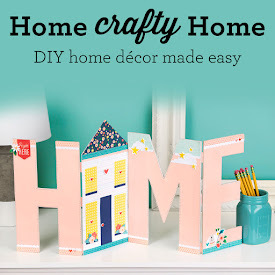 To make this treat holder, I start with a piece of 2.5"x7" card stock that I scored at 3-1/4" from each of the ends and then folded to make the "tent." I used Whimsy fundamentals, Sweet Leaf and White Daisy card stock, Charcoal ink, and watercolor pencils (without water) for the front. 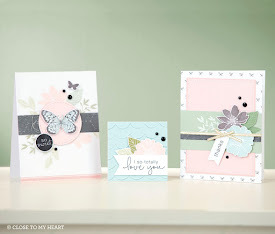 The Sweet Leaf ribbon is from the Whimsy collection. This little 3"x3" card uses Whimsy fundamentals, Basic fundamentals, Charcoal ink, and watercolor pencils (again without water) plus gold glitter gems. I hope these two little projects have inspired you. I'd love for you to leave comment before you hop on to the next stop. 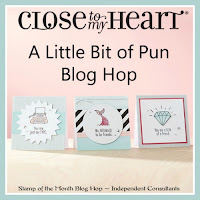 Be sure to go visit Vickie's blog next on our punny hop! I am in the process of modifying the recently released 64-card Basics Fundamentals workshop to use with the Silver & Gold Workshop Your Way collection plus Cranberry card stock. These are the second set of three cards from the 8-card workshop (8 each of 8 designs). After stamping my image from the Prince of Peace set, I used my gold marker to accent the guiding star and a few of the star "dots." A few gold glitter gems finished this one off. Look closely to see how I stamped the sentiment after inking it Cranberry then rolling the edges in Black. Finally, I colored in the leaves with my gold marker and added the gold shimmer trimmer "ribbon." Thanks for hopping by! 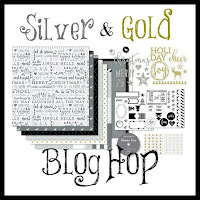 I'd love for you to leave a comment before you go on to see Cheryl's Silver & Gold project! All of these frames start with a 4"x6" piece of White Daisy card stock stamped with A Grateful Heart stamp and then watercolored. (Fern is used in all of the pieces.) The first one was stamped with Espresso that I quickly sprinkled clear embossing powder on then heat set to make my stamped image more waterproof. I watercolored it with Lagoon, Espresso, Toffee, Almond, and Fern. I used the Basics Fundamentals plus some Lagoon cardstock and Adventure ribbon. The final version also started with A Grateful Heart stamped in Charcoal with clear embossing powder. I used Eggplant instead of Cranberry and then pieces of the Basics and Enchantment Fundamentals and Enchantment ribbon. 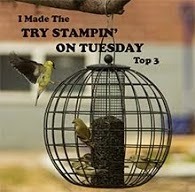 Thank you for visiting me on the Just for Fun blog hop! 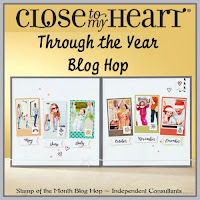 Please leave me a comment before you hop on over to Brandi's blog next! When I saw the stamp set, A Grateful Heart, I knew that I wanted to make a little sign to remember its message each day. (I've also made several to give as gifts that I will be featuring later this month.) 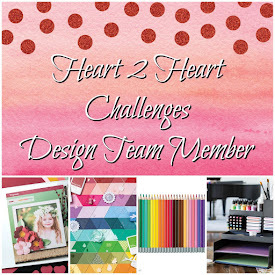 I think this project is the perfect link up for this week's Heart 2 Heart Challenge, Count Your Blessings. To begin, I cut a White Daisy card stock to 4"x6". I stamped A Grateful Heart with Espresso ink and then immediately sprinkled gold embossing powder on it, tapped off the excess, and then heat embossed. The purpose of this is two-fold: first to make it easier to watercolor and second to give it some sparkle. (Unfortunately that sparkle was impossible to photograph!) Also, note that you will not get the full, even embossing coverage that you would get with embossing, pigment, or Versamark ink. The I watercolored my wreath with my waterbrush and Espresso, Toffee, Almond, Fern, and Lagoon inks. Finally, I added the layers of Fundamental Basics and Lagoon card stock (lighter side). I placed the glass from my cheap frame onto my project and tied the white & gold ribbon around it then popped it in the frame. I love how it turned out! As I said, I have made a few more gifts. What color combo would YOU prefer? Please leave me a comment! The H2H challenge, Count Your Blessings, is open all month so please join us. Just click on the name to go to the blog. I'm very grateful that you've stopped by! 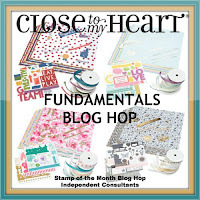 In honor of the Fundamental paper packs/collections being available this month only at 30-40% off, Close To My Heart has released instructions for a 64-card workshop (8 each of 8 designs). (You can find the instructions HERE.) 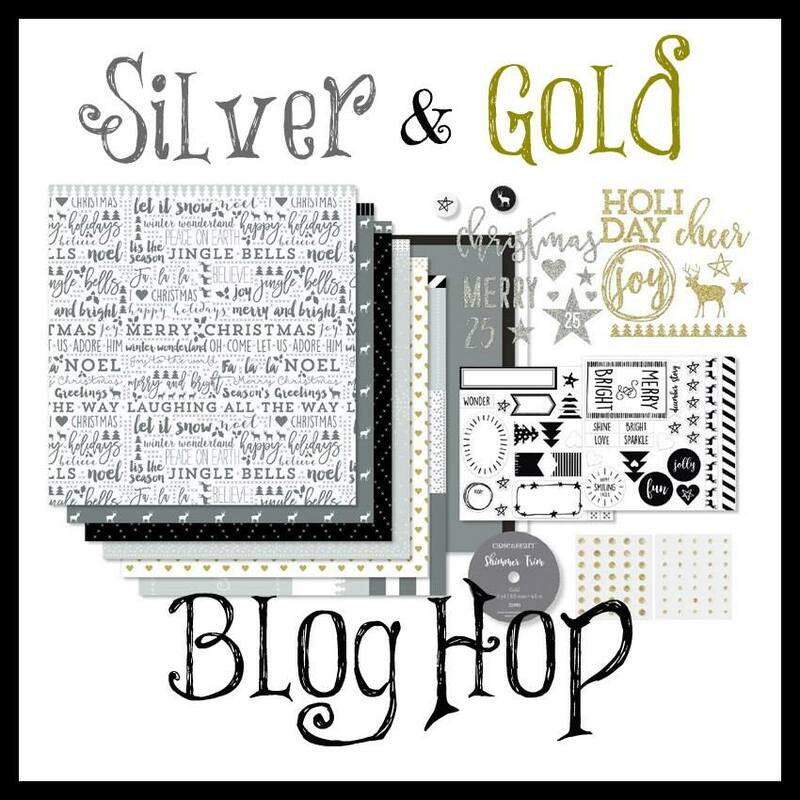 I decided to use these instructions with the Silver and Gold Workshop Your Way collection paired with the Beary Christmas- Cardmaking stamp set (C1691) and Cranberry card stock. While I don't have all 8 card samples prepared (much less all 64 cards), this card is pattern #2. 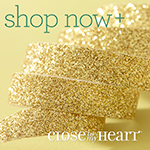 The gold shimmer trim and glitter dots are part of the Silver and Gold Workshop Your Way collection. The wreath is stamped in Black with Cranberry berries. Pattern #3 uses the adorable Santa hat stamp from this set. I first stamped the hat portion in Cranberry, and then the brim (Christmas sentiment) in Black. I stamped the pompom on scrap White Daisy in Black, cut out, and attached to the hat. The final card I have ready right now is pattern #5. Isn't that gold stripe paper stunning?!? I will be finishing up all 8 "stamples" in the near future so please come back to see the rest. 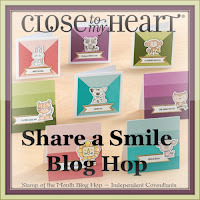 Don't forget to download your own instructions for the 64-card workshop at the CTMH Make It From Your Heart blog. Thanks for hopping by! 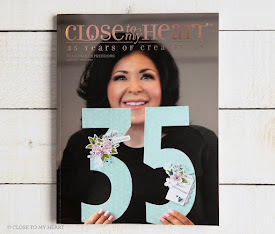 I'd love for you to leave a comment before you head on to creative Corinna's blog. 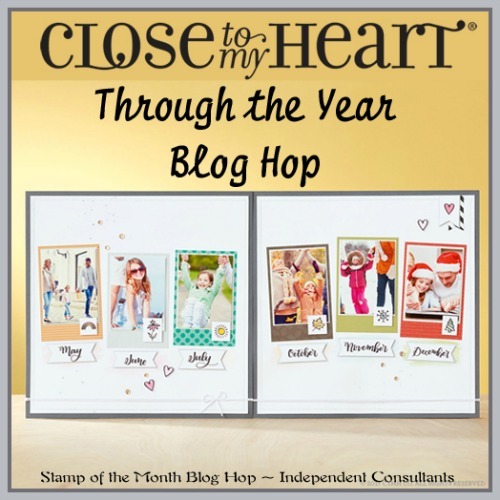 The November stamp of the month, Through the Year, is such a great stamp set! 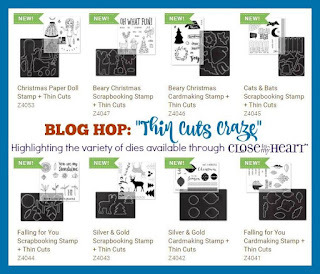 Be sure to follow this blog hop to get all kinds of creative ideas for how to use this set and stretch your creativity. 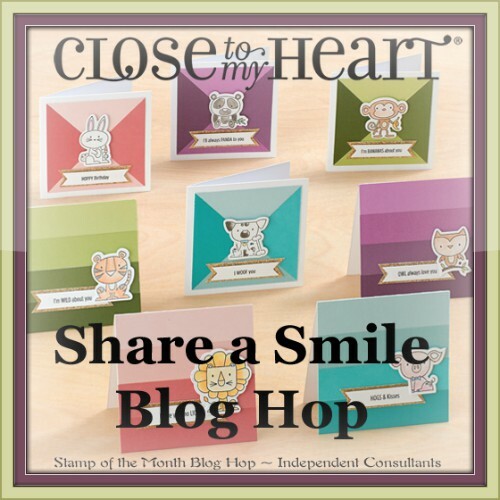 (If you're already hopping then you've probably arrived from Brenda's blog. From here you'll visit Priscilla's blog next.) My cousin is expecting her first baby next month, so I am making a Cut Above- The Story Begins (Baby Boy) album for her and an Everyday Life album for her mom (my first cousin). Here are the monthly cards that I've gotten made. The top 4x6 pieces are for Momma Megan's 12"x12" album, and the bottom 4x3 pieces are for Grandma Debby's album. Of course each month uses the November stamp of the month, Through the Year, and White Daisy card stock. The rest of the year is in progress. 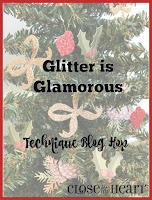 I'd love a comment before you hop on to visit Priscilla's blog next! This week's Heart2Heart challenge is "signs of the season," and this 3"x6" card fits the bill for November. It's a lovely size and such fun to use. The actual sketch comes from the Wishes how-to guide. I used the Falling for You collection and the Inspired Words stamp set (on the center panel). The left panel uses one of the Complements (stickers) from the collection, and the right one is a piece of the patterned paper in the kit. I used my waterbrush to color the center image and accidentally dropped a dot of color onto the bottom of my card. That mistake turned into a serendipitous border! I just continued to add dots all the way across the bottom and top of my card. It actually turned out cute. 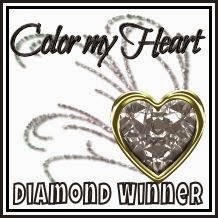 My CTMH team's motto is "It's not a mistake; it's an opportunity to embellish!" All my customers know this one too! Can you see how I added gold shimmer with the shimmer pen to all of the Saffron and Goldrush images? It sparkles in real life. In all things, give thanks! Please leave a comment with something/someone for which you're thankful. 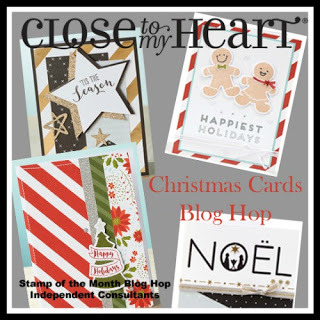 Be sure to visit the H2H blog! 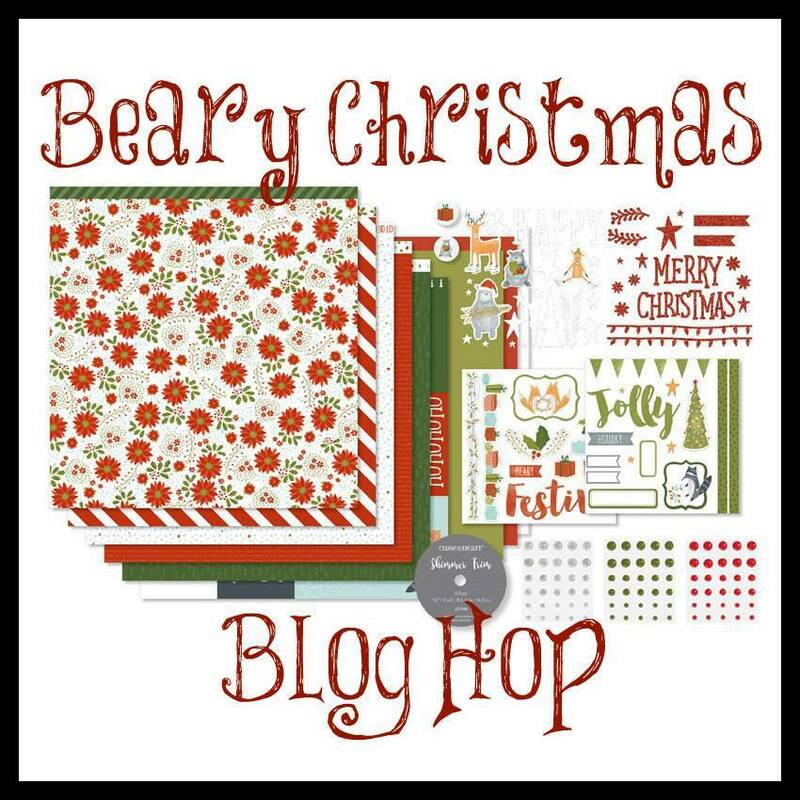 This card uses the Beary Christmas Cardmaking stamp set along with the paper, Beary Christmas dots, and silver shimmer trim. The Workshop Your Way collection includes the paper, dots, shimmer trim, and Complements for one great low price (or you can order the pieces separately.) I stamped the wreath in New England Ivy and then the holly berries in Cranberry. 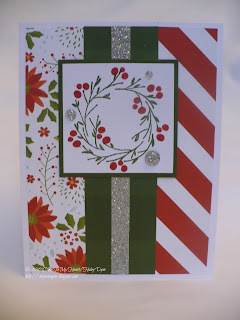 I love the glittery dots with the silver shimmer trim. 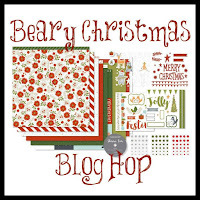 This card set uses the images from the October stamp of the month, Christmas Tunes, with the Beary Christmas collection. You can read more about this set HERE. Thanks for hopping by! Make this year a Beary Christmas! Now visit Kathleen's blog next! 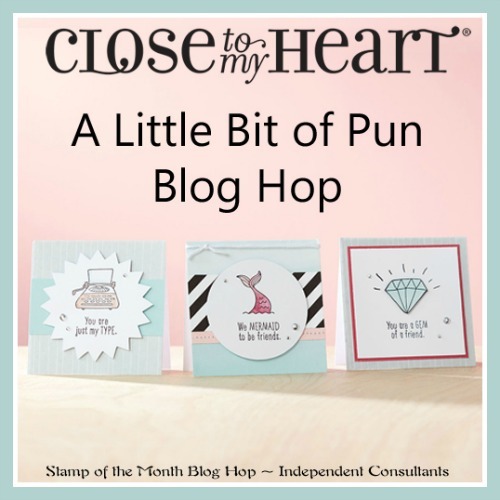 I have two 3"x3" cards for you using the Punny Pals stamp set. 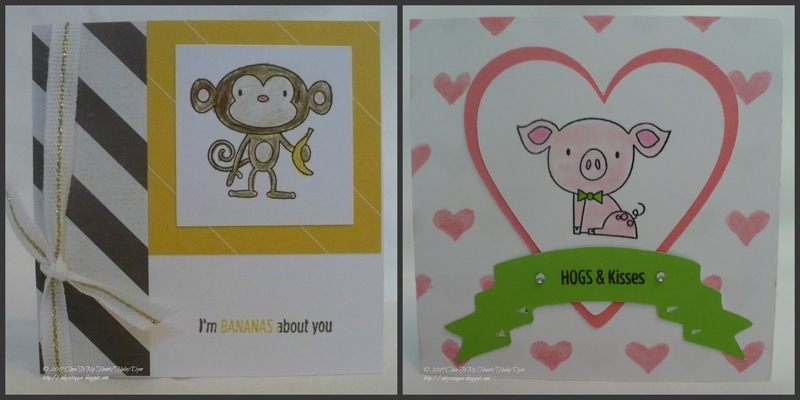 The first uses pieces of the Basics and Whimsy Fundamentals to create this monkey card. I colored this cute fellow with colored pencils. To create the sentiment, I first inked it up in Canary and then re-inked the I'm and about you with Nutmeg ink prior to stamping. A little white & gold ribbon finished it off. My second card uses the Adventure Fundamentals and card stock (Blossom & Willow). All of the shapes were cut with the CTMH/Cricut Flower Market cartridge. Here's a quick tutorial on how I waterbrushed the cute pig. First stamp the pig with Archival Black ink onto the White Daisy card stock heart. Then I turned him right side up to color from the neck down. I used Raspberry with my waterbrush to color the inside of his ears and snout plus his little spots. Finally I colored his bow tie with Willow ink and my waterbrush. (Clean your waterbrush by wiping it on a paper towel and squeezing more water through the brush tip until it runs clean. Thank you for hopping through! I hope my cards have shared a smile or two! After leaving me a comment, go visit ALYSON next.